This Mediterranean Chicken & Grilled Veggie Salad is the perfect meal to enjoy in the summer. It’s loaded with tender chicken, grilled veggies that have been sprinkled with Mediterranean spices, a creamy hummus. Serve it as a main dish or load your salad bowl for lunch. Happy National Hummus Day! The crisp spring air is quickly turning warmer by the day. Just last week, my car thermometer read 90 degrees. Summer and all of its sticky heat will be here before we know it. That being said, it’s time to bust out the grill and dish up fresh recipes that require very little effort. This hearty salad is full of crisp mixed greens, juicy grape tomatoes, thick slices of chicken, and creamy cannellini beans. The lemon tahini dressing that gets drizzled over on top is tangy, nutty, and extra creamy. I pretty much live on main dish salads during the summer. They take no time to prepare, and I prefer eating cold meals in the summer since it’s so dang hot outside. Any time I can get away without having to turn on the oven, I will. The grilled veggies and dollop of Sabra Lemon Twist Hummus that get added to this salad rock my world. I added a few pinches of za’atar to the veggies to add a burst of Mediterranean flavor. If you’ve never tried za’atar before, I highly recommend it. Za’atar is a blend of basil, oregano, sesame seeds, sumac, and salt. It’s vibrant, slightly nutty flavor adds bold flavor to any dish. It’s used a lot in Middle Eastern cuisine. If you have trouble finding the spice blend at your local grocery store, you can easily order it online. Sabra sent me enough hummus to feed a family of twenty. I have been eating hummus ’round the clock for weeks. I even made it rain hummus for my friends and family, and my refrigerator shelves are still loaded with hummus. If you ever find yourself with 15 containers of hummus at once, I’m hear to tell you that it freezes well. I’m just grateful that hummus is extremely versatile. I’ve been adding it to salad, dipping my daily dose of raw veggies in it, and smearing it on my lunchtime sammies . So far, I haven’t found a flavor of Sabra Hummus I haven’t liked, but here are some of my favorites: Lemon Twist, Jalapeño, Supremely Spicy, and Chipotle. Whether you’re dipping, dunking, smearing, or dolloping, go get yo’ hummus on! Sabra is offering a coupon to save on your next hummus purchase, but you have to hurry, because today is the only day you can print the coupon. 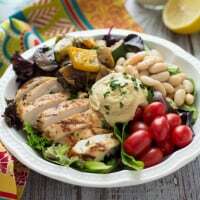 This hearty salad loaded with tender chicken, grilled veggies that have been sprinkled with Mediterranean spices, a creamy hummus. Serve it as a main dish or load your salad bowl for lunch. Preheat the grill to medium heat. Place the prepared veggies in a non-stick grill skillet or grill basket. Place the skillet on a work surface that you don’t mind getting dirty and drizzle the olive oil over the veggies. Season with pepper and za’atar. Give the basket a shake to combine. Place the basket on the grill and allow the veggies to cook until they become tender, about 10 minutes. Make sure you stir the veggies every few minutes so they cook evenly and don’t burn. Season the veggies with a generous pinch of kosher salt right before you remove them from the grill. Allow the veggies to cool to room-temperature. Season with salt and pepper to taste. Add tahini, lemon juice, dijon, lemon zest, and honey to the bowl of a food processor. Pulse until smooth. Slowly drizzle in the olive oil while simultaneously pulsing the dressing. Season with salt and pepper to taste. Transfer the dressing to an airtight container and store in the refrigerator until you’re ready to use. Add the mixed greens to a large bowl. Top with grilled veggies, sliced chicken, grape tomatoes, and cannellini beans. Serve with a dollop of hummus and drizzle of lemon tahini dressing. Disclosure: A big thank you to Sabra for their generosity. They really take the saying sharing is caring to a whole new level. This recipe was developed for the lovely folks at Sabra. All opinions are my own. Thank you for supporting my recipes and site while I work with brands I adore. This looks so hearty and delicious! Totally my kind of dinner! Yes, yes and more yes. If you served this to me for lunch or dinner any day I would be a happy woman! Waaaaaahoooooo! Looks like we both had grilled chicken salads in mind for Day o’ Hummus! I love all those grilled veggies you fashioned up – how delicious! P.S. Does this mean I get to see you at Sabra’s factory in Richmond, VA in a couple of weeks???? I want this for lunch!!! Love the za’atar!! Well, you just KNOW I’m loving the double dose of lemon in this recipe! Even though (aside from one day last weekend) it hasn’t been TOO warm here yet this year, I’m already craving lots of cool, crisp salads. And grilled veggies make an appearance at every meal here, all summer long. Love this recipe! This salad looks very filling! I love putting grilled chicken in my salad and that dollop of Sabra hummus is just the perfect touch to this already epic creation! Now this is my kind of salad! It looks fantastic! And that lemon tahini dressing … yum-o! Any salad that involves a major dollop of hummus is a salad I want to be eating! I love a good Mediterranean salad – this one looks spectacular. The addition of hummus looks fun! Happy Hummus Day! This salad looks amazing! I could totally live on this this summer. And this is just my 10000th reminder that I need to get some za’atar and FAST! This salad is a big bowl of flavor! I think I could live off it all summer long and welcome to the za’atar lovers club! I can totally get behind this hummus centric salad for the summer. Love hummus! I couldn’t agree more. It’s becoming my favorite condiment. What a gorgeous salad! I love the roasted veggie with hummus on it – yum! It sounds so hearty and filling.